5WGaming.com : The evolution of gaming journalism » Blog Archive » So Where’s The Beer? » So Where’s The Beer? 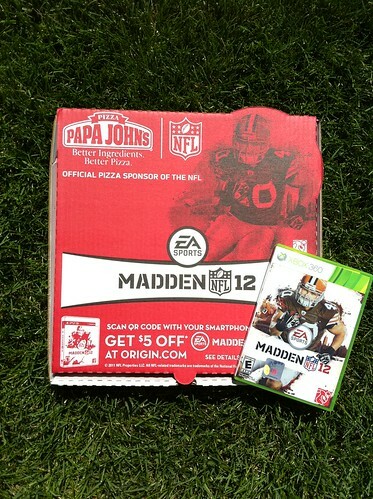 I’ve got Madden NFL 12, which curiously arrived in a pizza box from Papa John’s (they’re running a $5 discount on the game through EA’s Origin.com), so I’m ready to dig into this year’s highly-anticipated football title. There’s an embargo on in-game content until August 26th - believe me, the big media outlets can ensure that simple blogging folk like me don’t start scooping them - but I’m happy to take any questions you may have, and I’ll discuss them as soon as I’m able. Feel free to follow me on Twitter as well (@SDrotar_EAGC) and ask your questions there.